Which chocolate bars do they fit? 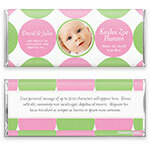 This retro-inspired wrapper is the perfect backdrop for a photo of your little one. This unique chocolate bar wrapper may be personalized for free and is available either fully-assembled with a chocolate bar included, or as just the wrapper only for easy DIY assembly. A selection of foil colours are available for you to include with your order. Design: Large polka dots with photo space. Personalization: Front names and information, photo and back message. Recommended Photo Size: 406 W x 406 H pixels. How do I ensure that I will receive my items by a specific date? During the checkout process you will be asked to provide the date that you require your items. This information will be referenced throughout our production process to ensure the timely preparation and delivery of your items. Do you offer rush processing and overnight shipping?